So, everyone knows it, drinking and boating do not mix. While I am very social and love sundowners as much as anyone else, I am always appalled at the normality of seeing drinking and boating. My rule is: if I am boating, I do not drink alcool, period. Exception are when anchored or docked for the night. If I know I will be boating, no drinks. I even buy de-alcoholized beers for that effect, as I really enjoy the taste of beer. Its not even what I see in person. I do watch a lot of YouTube videos, and frequently I will see people on passages drinking wine and such. This is a no-no in my book. I praise my favourites world sailors Paul & Sheryl Shard of Distant Shores as NOT doing that. 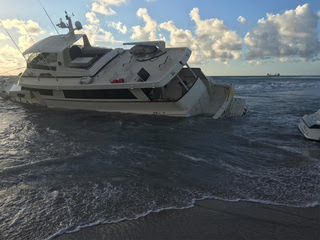 Just yesterday, in the news, a bozo stranded his Mega-Yacht stranded on Beach at Palm Beach Inlet in Florida! If you still want to drink, there is even a Boat Sober app which provides a Blood Alcohol Estimator that allows the user to estimate their BAC based on their gender, body weight and how many drinks they have consumed in a specific period of time. This tool is only that….a tool. Be aware though, that you can be arrested for a BAC less than the legal limit if you show signs of impairment. And it really is not about getting arrested, drinking while on the water increases the chances of an accident or drowning. And nobody wants increase those odds.